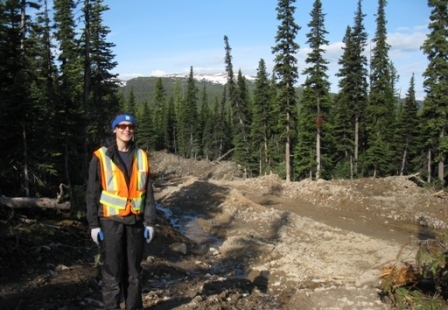 I obtained a Bachelor of Science in Earth and Ocean Sciences from the University of British Columbia in 2008, and will be returning in the fall of 2011 to pursue a Masters with the Mineral Deposit Research Unit (MDRU) of UBC. During the summer of 2006, I took a 3 week field course in volcanology at the University of New Mexico. In 2007, while assisting a team of economic geology graduate students, I partook in the mapping of copper porphyry and epithermal gold systems. I found the research in volcanology and economic geology fascinating and subsequently tailored my course-load to include classes in these fields. Since graduation, I have explored the many different realms of geology by working in geothermal resource exploration, monitoring volcanic gases at the Hawaiian Volcanic Observatory and by working as a geophysical field assistant with the United States Geological Survey. Some of my other interests include being outside, reading, traveling, dancing and playing sports. Project: Geologic Framework for Gold Mineralization in the Blackwater Deposit of the Nechako Plateau, Central BC. I will be working under the supervision of Dr. Craig Hart of the Mineral Deposit Research Unit and with New Gold of Vancouver, BC to obtain a M.Sc. in Geological Science from the University of British Columbia. Presently, this thesis is in the nascent stage of its development. My project area is the Blackwater Gold prospect, located 110 km southwest of Vanderhoof, BC. The prospect is thought to be a low-sulphidation epithermal type deposit. The objectives of the research project are to understand the context of mineralization and to obtain a better understanding of the geological setting through geological mapping, and examination of alteration assemblages, volcanic textures and geochemistry. Potential foci of my thesis include trace element zonation of the deposit, the identification of volcanic textural controls of hydrothermal alteration, or reconciling the presence of high temperature alteration minerals such as tourmaline and garnet in a supposed low temperature epithermal environment. Roundup 2012 Poster: Characterization of the Blackwater Gold Deposit, Central B.C.